May 2016 was a big deal for me in terms of my author career. It marked the very first time I would sit in front of a room of people and pretend I knew stuff. It also marked the very first time I would ever read my own original work to strangers. A week before all this happened, I was at another SFF convention, simply hanging out and having fun like I’ve done at conventions all my life. While there, I met up with my pal Adron Buske of Nerd for a Living fame (www.nerdforaliving.com), who was moderating several panels at that particular con. I told him about my upcoming large step into a whole new world, as well as about the Wordwraith Books vendor table we’d be having later in the year at Kansas City Comic Con. I laughed … but knew he was probably right. Even though I was a little bit terrified of my upcoming panelist gig, there was a part of me, a larger part of me, that was absolutely giddy about it. 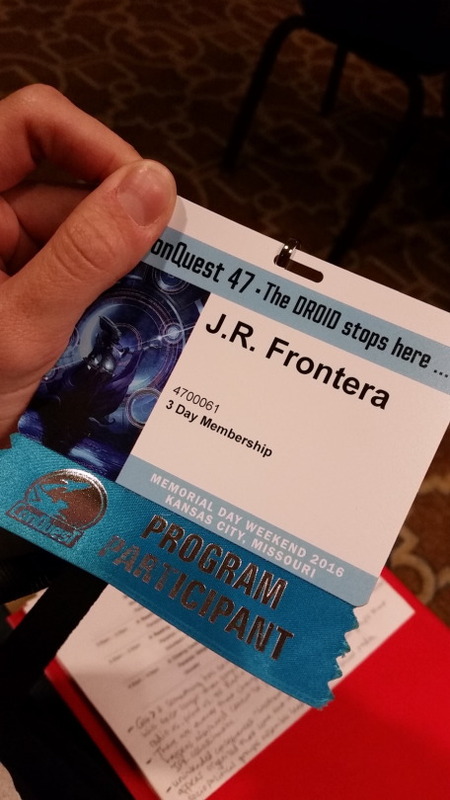 So the weekend of ConQuesT 47 came, and I found myself sitting BEHIND the table. I had a banner that said “Program Participant” on my badge, and one of those cool tented paper nameplate things. My bio was even in the program! I remember my first thought upon receiving my registration materials that first day: Holy crap. This is real. Whether I was really ready or not, it was happening. It may not seem like all that big of a deal to most people. ConQuesT is generally a more intimate, localized convention compared to many of the big name events. But I’ll try to put this in perspective: when I was a small child, I’d get so nervous to go to school I would literally make myself sick. Over the last few years, I’ve had to force myself to approach industry professionals at conventions to introduce myself and chat, faking a calm exterior but in reality, sweating profusely (literally) from the anxiety. As recently as last fall, I didn’t want to have an active speaking part at our NaNoWriMo workshop because I was too shy about getting up in front of people. You may have guessed: I’m an introvert. But that doesn’t mean I don’t love talking to or being around people. I actually do love it. But I don’t love it all the time, and I don’t love talking to or being around just anyone. And this is what I have recently discovered. Once I actively realized this, I started forcing myself to take those baby steps I mentioned, heading in a purposeful direction. I reached out to people on social media. I approached people at conventions. I took workshops. I gave workshops and took on only very small roles. With each step, it all got easier and easier. Yes … I faked it till I made it. Until finally this spring, I realized that all the workshops and panels I was attending were mostly doling out advice I’d already learned, taken to heart, and implemented. That’s when I internally decided I was qualified to sit on a panel myself. And ConQuesT, being smaller and more local, was the perfect place to start. I ended up on three panels: “Are Expectations of Female Characters in SF/F too high and unrealistic?”, “NaNoWriMo: Dare to Write a Novel in a Month”, and “Fanfiction: Underrated Realm of Literary Merit?”. I can probably never go to a convention again without participating in some way. It was absolutely one of the best experiences of my life. It’s one of the best ways to meet new people, to network, and best of all … to help others who are in the same spot you were in not all that long ago. That was my favorite part. I already love to help out other writers when they are stuck or don’t know what to do next, whether that’s in the writing itself or what to do after you’ve finished a novel. I really, really enjoyed being able to offer my experiences and advice and answer questions in all of my panels. And … I actually had answers! Lol. That was also a huge confidence booster. I came away from ConQuesT with an entirely new mindset and loads more confidence in regards to my own author path and my original works (which, by the way, were well-received by the strangers, yay!). I came away feeling like a real professional. Yes. I faked it till I made it, and now I’m quite comfortable here. So what’s behind that curtain? A whole lot of freakin’ awesome!!! ❤ Jeni and the Wordwraiths.